Much of that rethinking is happening at WSU, where architecture and engineering scholars are designing future skylines made of wood. Not often used in today’s urban infrastructures, wood is a renewable resource. It can be sustainably forested and manufactured into panels that have high-performance properties comparable to those of mainstream construction materials. Interdisciplinary research teams supported by grants from the U.S. Department of Agriculture and National Science Foundation are developing manufacturing supply chains and improving performance of cross-laminated timber, or CLT. 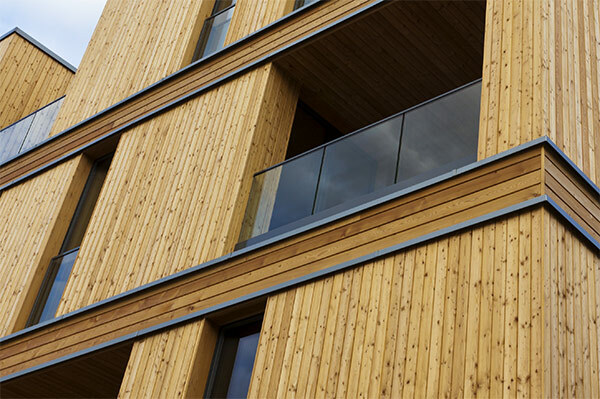 Heavy CLT panels are manufactured with wood that would otherwise pose fire and pest hazards. The panels have 3 main benefits: they improve local forest health, sequester carbon, and reduce construction times. The economic impact of these WSU innovations have the potential to be felt throughout the Pacific Northwest. Wood materials needed to manufacture CLT can be sourced from Washington forests. Researchers Don Dolan and Mike Wolcott are leading teams to scout and develop the rural-to-urban supply chains that would make manufacturing possible, as well as developing guidelines that will help builders make broader use the material. The teams are also developing new technology to improve panel performance and capabilities. WSU is teaming with industry and civic leaders in Washington to rejuvenate sawmills and create new jobs in rural towns where logging once thrived. Dr. Wolcott is on the leadership committee of a CLT coalition convened by Forterra, the largest land, conservation, stewardship and community building organization in the state. The coalition aims to bring CLT to Washington by reducing technical barriers, incentivizing produces and users of engineering wood products, and generating public and private investment.